Quite often viewed as the modern era in chemical manufacturing, continuous manufacturing has been gaining steam over the past few years as a means to manufacture drugs more efficiently, ensure safety and bring products to market faster. While batch manufacturing has been the go-to method of chemical manufacturing, times are changing and more and more Contract Development and Manufacturing Organizations (CDMOs) are considering continuous, or flexible manufacturing alternatives. This new method is getting lots of attention lately, because of its claims to provide cost savings, as well as improved quality and efficiency. But, while there seems to be great promise for continuous manufacturing the jury is still out, since it still is in the early stages of use, with only a handful of commercialized drug products having been manufactured using this method. But as with most things, there is a time and a place for everything, and while continuous manufacturing is growing in importance, it’s no time to send batch processing to pasture quite yet. Each method has benefits and drawbacks. In use for the past 50 years, batch processing currently remains the key manufacturing method. With batch technology, the ultimate finished product is developed in a series of steps, which must be completed before a new batch can be processed. Using this method, CDMOs can produce specific amounts of a certain product and then adjust their manufacturing priorities according to the changing demands of the market. A benefit of batch production is that the set-up costs are typically modest, and each batch is more easily tailored to be unique. There are also certain drugs that can only be manufactured in batches because of their composition. With batch processing, there also may be more flexibility if a company needed additional capacity. Because a continuous production line is designed specifically to process one specific drug, it may not be possible, in a shortage, to switch processing easily to another drug that requires a different process. So, batch processing will continue to serve a need in the marketplace for the foreseeable future. The cost of building special GMP suites dedicated to the manufacture of a specific drug is unrealistic for most firms, unless it’s a blockbuster drug that requires continuous and fast production, and which will continue to have huge demand in the market. Yet, continuous manufacturing is increasingly meeting a new need in the marketplace. It takes a drug from raw materials to final product – seamlessly – with no need to shut down equipment or have any down time as the product is created. Continuous manufacturing, which is GMP compliant, requires a smaller physical footprint, which also helps it be a more environmentally friendly option. The risk of human error is also reduced because continuous processing means fewer people are involved in the production process from start to finish. Additionally, the U.S. Food and Drug Administration (FDA) estimates that some drugs which normally take a month to produce using conventional batch processing, may only take one day to make using continuous manufacturing. This flexibility enables product to be produced in response to market demand (just-in-time) rather than the sponsor having to maintain large inventories in case of demand surges. Another key benefit is that continuous manufacturing does not compromise quality – on the contrary, by eliminating breaks between steps and reducing opportunities for human error, many consider it to be more reliable — and safer. Fast-tracked drugs. Many new therapies are receiving fast track, or Breakthrough Drug status, which allows them to take a much shorter clinical development path to FDA approval. While this is a good thing for the market and sponsoring firms, CMOs are challenged with significantly speeding up the chemistry and manufacturing processes using traditional methods. Personalized medicine. New drugs can be highly targeted and potent, so the amount needed is often much smaller than traditional ones. The high price and novelty of these treatments can make it difficult to predict market demand and the amount to manufacture. The need for flexibility in manufacturing technologies has never been greater given the need to ensure critical drugs are available for patients, with the assurance of extreme safety and quality. 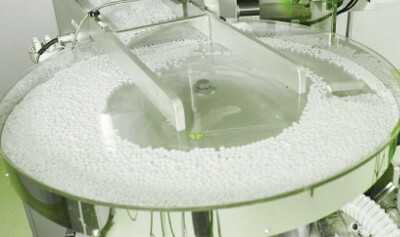 While continuous manufacturing will increasingly play a greater role in meeting these needs, batch processing, which has been the preferred manufacturing method of pharmaceutical manufacturing for the past 50 years will continue to be the de facto standard — at least for the short term. The key is for CDMOs to explore all options, taking into consideration the innovative new processes and technologies transforming the pharmaceutical industry, but also taking a smart and realistic approach to follow the best option available today. Ed Price is President of PCI Synthesis, a pharmaceutical development CMO based in Newburyport, MA and the largest small molecule drug substance manufacturer in New England. PCI Synthesis is also a commercial manufacturer of NCEs, generic active pharmaceutical ingredients (APIs), and other specialty chemical products for the medical device industry. As a CDMO, PCI Synthesis provides emerging and mid-sized pharmaceutical companies access to the expertise needed to develop and manufacture complex small molecules. How Do You Ensure a Smooth Technology Transfer in API Manufacturing?